Picture this: the YMCA faces a difficult financial situation. Attendance at its programs and use of its facilities has fallen off and the neighborhood around its building has undergone a vast transformation. Retaining and recruiting members is difficult. The facility is being eyed enviously by others. Today, 2015? Yes, indeed. But it was also the situation faced by the fledgling organization in 1871. Washington’s Young Men’s Christian Association (YMCA) has gone through many trials since its founding and made its home in a variety of locations. YMCA Gymnasium (left), William Chauncey Langdon (right). 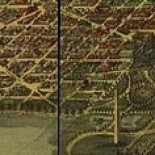 This entry was posted on November 18, 2015 by dchistorystuff in Architecture, DC History, DC Neighborhoods, Foggy Bottom, Maps, Uncategorized, Washington DC, YMCA, Young Men's Christian Association and tagged 1736 G St NW, D.C., District of Columbia, Foggy Bottom, Lincoln Hall, Lincoln Hall DC, Maps, Washington DC, Washington DC history, William Chauncey Langdon, YMCA, Young men's Christina Association.